A resounding 71% of you agreed that no amount of elbow grease can make a terrible product shine. But lets not forget the 29% of you who genuinely believe that advertisers really can polish up the proverbial and execute some kind of Fairy Godmother play with a swoosh of their advertising wand. 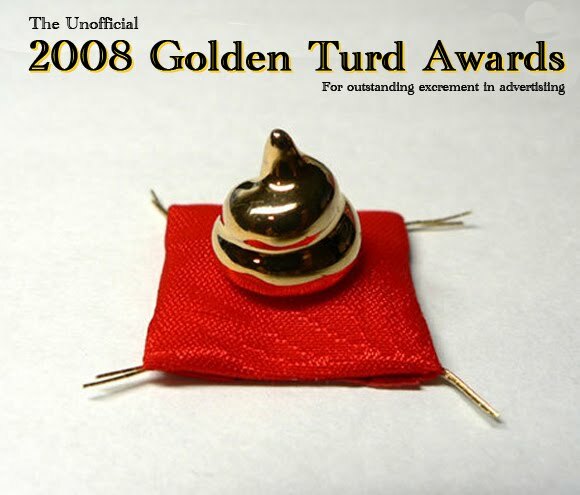 So Id like to propose something to the Australian marketing community: lets set up the unofficial Golden Turd Awards right here in sunny Australia, a country well known for its irreverent sense of humour and ability to have a laugh at itself. you will suggest campaigns where advertisers have executed incredible TPS (Turd Polishing Skills – well it wouldnt be marketing if it didnt have a three-letter acronym, now would it!). Deadline for suggestions of the most outstanding achievement in the art of turd polishing will be December 1st 2008. The top suggestion with the most creative and entertaining justification will win some fantastic prize I have yet to think of. It will be fantastic though! we will then select a prestigious panel of excrement beautification specialists who will decide on a shortlist of the most deserving work. The shortlist will be announced on December 15.
the final award winners will be announced after a break for Christmas on January 27. On this fine day in 1910, the venerable Thomas Crapper passed away. It seems only fitting then that we celebrate on the anniversary of the passing of this toilet pioneer. We will then present the award in person to the winning agency. So without further ado, I hand the baton for this one over to you. Please discuss campaigns that you think deserve to be nominated in the comments section below, and send in your nominations for campaigns that have demonstrated exceptional TPS to Scott. May the best steaming heap of dung win!